Works must be limited in edition, 25 or fewer copies, each signed and numbered. AP proofs are accepted. Submitted artwork must be designated for this event; not sold in advance or substituted. Only complete submissions received by deadline will be considered. Late submissions will not be considered. Eight to fifteen 8-15 artworks submitted per artist, with good quality jpg images; one to three images submitted for other than 2D work. If the images will exceed 2 MB, please upload your images to Dropbox, Google Drive or another file-sharing service and provide a link in the body of your submission email. See AP TOOLBOX for help here. An image list, in this order: title, series numbering if applicable, year completed, medium(s) specified, dimensions in inches h x w x d, price including HST if applicable. • Include any special considerations important to the display of your work. • Booth size - please indicate if you are applying for an 8 foot or 10 foot wide booth, or if no booth is being requested. All booths are 8 feet high, with two ends wall, each 2 feet wide; for pictures and details see here. Your presence is required to install the art, and during both exhibition dates and times. All applicants will be notified of art selection by email on or by Thursday November 1, 2018. The Artist Agreement will be attached with a deadline for return with a refundable $75 deposit, cash or cheque, which will be returned to participating artists at the exhibition closing. Some artists save their AP cheques to reuse for future events. Images submitted may be used by Art$Pay for event promotional purposes. Participating artists help with the distribution of event promotional flyers and social media posts. Works must arrive ready to install, with proper hanging mechanisms; see FAQ 9. Artists do their own art installation with Juror consultation. The AP grid wall display system will be installed and removed by a hired moving company. Artists handle their sales transactions. Sold art remains as installed in the exhibition until closing at 4 pm on Nov.10. Artists agree to pay 20% commission to Art$Pay on all sales at the closing on Nov. 10, and on any sales and commissions received as a result of this opportunity for up to 30 days inclusive following the exhibition, payable when the artist receives payment. 1. Why is such a big range of 8 to 15 images being requested for submission, and why do I have to pre-select my display booth size? The extended range of images is intended to accommodate member’ varied arts practices. Many artists find including works of varied sizes and price points helps with event sales. All selected art remains as installed for the duration of this annual exhibition and sale. A submission should include sufficient artwork to fill the pre-selected booth and to allow for the jurors’ selection process potentially excluding some of those submitted works. The pre-selected booth helps jurors and AP plan the exhibition. If insufficient work is approved to fill a booth, the artist will be offered space on a larger display wall. 2. Do I need to be present on both Nov. 9 & 10? Yes, to give the public an opportunity to engage with the artist, to process your sales, and to take advantage of other opportunities which often happen as a result of events. 3. I’m interested in submitting 3D work, digital work or doing an installation. What’s involved? Installation work is possible in the main entry to Catalyst 137 and the main adjacent exhibition area has a permanent wall mosaic screen and projector available for use by AP. These spaces in the building are open to the general public during regular business hours. Please contact AP for more details if you are interested in displaying 3D, digital and installation work. 4. What about the Fees and Commissions? There is no submission or event fee required from AP members to make a submission, or to participate in this exhibition. This $75 refundable deposit will be held only and will be returned except in the case of nonattendance or non-compliance. In those circumstances it will be applied against that artist’s event expenses. The 20% pre-tax AP commission on sales and commissions helps to cover exhibition costs and to provide future AP member opportunities. 5. Who selects the art? Two jurors, who will also consult during art installation, are local visual arts experts, and will be announced after art selection. 6. Can I sell my submitted approved artwork; bring in fewer works than approved, display the approved work in another exhibition, or substitute these with works not approved by the jurors? No, by submitting you are promising that all approved artwork will be available for this event. If someone is interested in purchasing, invite them to the event! 7. Can I make or bring more work to replace ‘sold art to the art installation? No, not for this annual exhibition and sale. This is reflected in the range of images which may be submitted for approval and the submission deadline, which has been set as late as possible. 8. Who installs the artwork in exhibition and provides the art labels? The artists provide their own art labels using the AP format in the Artist Agreement, and install their own work in consultation with a Juror on a grid display system provided by AP. 9. What’s provided by AP, and what does the artist have to provide? AP provides artist identification buttons, the installed grid wall display system, hanging hardware and a hanging shallow shelf / basket 24” wide x 12” deep; suitable for small work, stacked unframed works, business cards, sales processing needs and intended to replace the need for tables. AP will email if extras of these are available. With the predicted number of participants and guest circulation, it’s not possible for artists to have individual tables in addition to their booths, and displays need to be kept within the booth end walls parameters. Please contact AP if that is a problem. Art lighting is not required in this venue; the general level of illumination is good. Name signs for booths with Skills & Services listed, are under review, with details to come. AP is exploring if there is a better way. The artist provides their approved art, with all 2D work wired to hang from hooks, art labels using the AP format in the Artist Agreement, a small stool or chair as needed, any display stands, plinths or equipment specific to their artwork is to be included in the submission and approved by AP. With a black grid wall system, some artists prefer to display small or fragile works mounted on a larger board or sheet or to hang sheeting, fabric etc. behind their main back wall. For that planning, add 2” to the width of a 10 foot wide booth, and 1” to the width of an 8 foot wide booth to account for the booth support legs. Please do not hang backings on the side walls which may be shared in a line of booths, or assume working access behind the booth. Depending on final configuration, as needed AP will install black fabric between a row of back to back booths. Back booth walls are not shared. 10. Who processes art sales during the exhibition? Each artist handles all of their own financial transactions and tracks sales on copies of their final image list, to use when calculating the 20% sales commissions owing to AP at the end of the event. 11. Will there be an admission to this exhibition? Yes, to help offset exhibition expenses, the Friday opening reception will be a ticketed event and a small cash admission will be required on the Saturday, with children 12 and under free. An event ticket purchased for Friday is good for free re-admission on Saturday. 12. Why is there a deadline for art submission; why can’t I make art right up to showtime and bring in what I want? Many art shows require that the artists cover event expenses up front with application and event fees, providing and setting up their own display. These models involve significant time and financial risk for the artist. The AP reputation for great juried art and events has to be built, promoted and maintained. Otherwise those out of pocket AP expenditures don’t get covered by event tickets sales and the 20% sold art commission. An artist-run, non-profit organization, Art$Pay connects visual art practitioners with opportunities, community, and advocates for fair pay. The $35 annual member fee pays another practitioner to work on members’ behalf to do postings, website maintenance and communications. 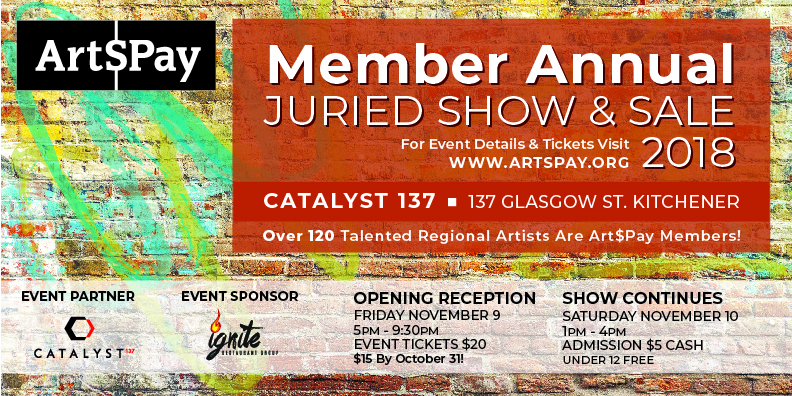 Member benefits includes access to the display system at member rates, a Discount Card for use at Curry’s Artist’s Materials, Chapters Waterloo, THEMUSEUM, ZM Cycle & Fitness, Open Sesame and more, free art critique sessions in public galleries with paid professional art experts, art rental opportunities including The Centre In The Square, juried exhibitions and sales organized for members, notifications of posted jobs and Calls, subsidized workshops, monthly Meet-ups with organized Artist Talks, and other benefits here. More details will be provided in the Artist Agreement.